This is where we will highlight one of our clients pets every month. We will give a short history of the pet and a color photo. This month is Andrea Kyriacou’s newest addition to her family. This is Chino. 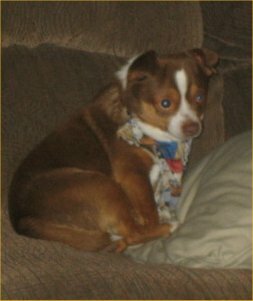 He is a 9 year old Chihuahua who was given up to a local veterinarian to be euthanized because the family no longer wanted this little charmer. With a heart murmur that could become expensive to treat, and no one else wanting to take on this little guy, Andrea was asked to ‘foster’ him until a home could be found. Well, after 2 days at the house, needless to say, he has a home.